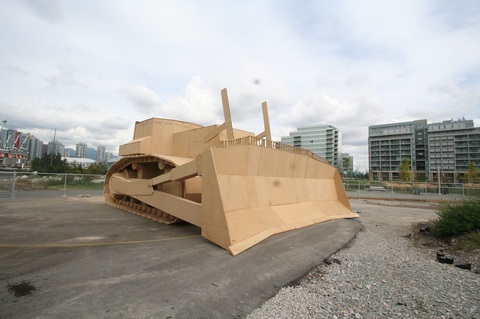 The Games are Open takes the form of a larger-than-life bulldozer – with shovel down it faces the expanse of interim lands awaiting future development along Vancouver’s South East False Creek. Left as evidence of 9 weeks of inspired labour artist team Köbberling & Kaltwasser constructed the artwork from 1,000 wheat board panels liberated from the neighbouring 2010 Olympic and Paralympic Winter Games Athletes’ Village. The site, form and material invite re-invention. Typically used as a substrate for interior finishings the wheat board, a new, “environmentally friendly” material composed of 94% wheat and 6% neutral binder, has been elevated to assume a structural role in the depiction of a machine usually associated with fast and drastic change. Exposed to weather, soil and the passing of time the wheat board construction will give way to a process of gradual decomposition, its form providing fodder for new growth. Transitioning slowly from sculpture to plant nursery, the project’s bounty will be offered for transplanting throughout the future development. Subject to economic, biological and social forces The Games are Open excites the public imaginary, offering up new possibilities and alternative uses.